You’ll never look at carousels the same again. Guy Haines (Farley Granger) is a professional tennis player quasi-engaged to the daughter of a prominent Senator. On his way home from a tennis tournament, he encounters Bruno Antony (Robert Walker). Bruno is a layabout spoiled rich boy who recognizes Guy as a famous athlete. As they talk it comes to light that they both have someone in their lives that stands in the way of them each finding true happiness. Guy’s trashy wife won’t give him a divorce, and Bruno is waiting for his tyrannical father to pass on so he can be financially independent. Bruno has a pitcher of alcohol and starts rambling about his theories of how to commit the perfect murder. And wouldn’t it be nice if Guy’s wife and Bruno’s dad both happened to be conveniently murdered? And they can’t murder their own problem people, they have motives that are too obvious. But what if…they swapped murders? Bruno would murder Guy’s wife, Guy would murder Bruno’s dad. Neither would ever be suspects in the other murder. It’s the perfect crime. Guy becomes uncomfortable and, in order to get away from the drunken Bruno, placates him by telling him it’s an interesting idea. Guy rushes out, leaving behind his personalized cigarette lighter. Bruno puts it in his pocket and finishes his train ride in solitude. In the next few days, it becomes apparent that one of them took that conversation very seriously, with deadly consequences. Another great Hitchcock piece, “Strangers On A Train” isn’t a whodunnit, it’s a “Will they catch the right person?” Even still, the buildup to the first murder is masterfully done, so that until the last instant we still aren’t sure if he will really go through with it. And as if traveling carnivals don’t already give me the heebie-jeebies. You’ll never hear tinny music the same again. 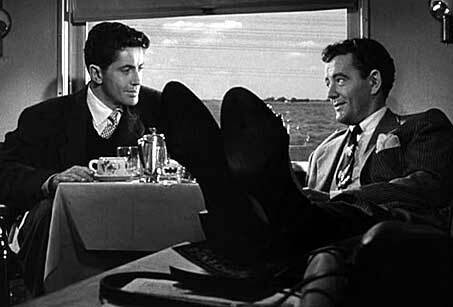 Farley Granger and Robert Walker are a great team, too. The sharp contrast in their characters is perfectly balanced throughout the film, as the threat of discovery increases. And while the rest of the cast is also enjoyable, special mention must be made of Patricia Hitchcock. Yes, the famous director’s daughter. She plays Guy’s fiancé's sister and has perfect comedic timing. It’s a shame she wasn’t cast in many more movies. She’s very fun to watch. Strangers On A Train comes on Tuesday, July 24th, 9:15 AM CST. POLL: It was suggested last week that I start making this a link-up thing. Would you be interested in that? Doing your own Movie Monday post to preview something coming on TV or discuss what you saw over the weekend? Let me know in the comments, please. This sounds like a good movie!